"In the heat of desire, love can turn to deception. Nothing is what it seems when day turns into night." 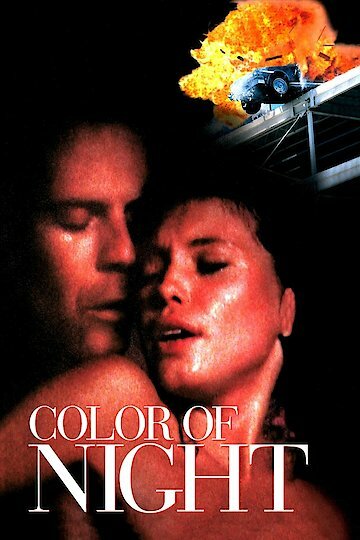 Color of Night, is a mystery film that begins with Bruce Willis' character, Billa Capa, a psychoanalyst who becomes gravely despondent during the aftermath of the suicide of one of his patients. The Capa is strongly affected because the suicide was a jump from the window of Capa's office, right before Capa's eyes. As the patient's body was awash in blood and gore, while wearing a bright green dress, Capa acquires psychsomatic color blindness and is unable to detect the presence of red coloring. In an attempt to restart his life, Capa stays with a friend and Scott Bakula's character, Dr. Bob Moore. Moore invites Capa to sit in on one of his group therapy sessions. However, Moore winds up being violently killed in his office, leaving Capa to investigate his friend's death. As Moore would have group sessions on Mondays, the investigating Lt. Hector Martinez, as well as Capa, regards them all as potential suspects. Capa remains living at Moore's place and winds up having an affair with Rose, a girl who comes and goes without notice. Capa slowly takes over treating Moore's clients, learning about their issues and history. Soon, one of the patients is slain, with Capa witnessing several attempts on his own life. Capa further discovers that only one of the members has not been romantically linked to Rose. This leads to a major revelation about Rose, with the various group murders, including Dr. Moore, laying at the feet of her unstable brother, Dale. Capa confronts Rose and Dale. As Dale tries to murder Capa, he is thwarted by Rose. She then tries to end her own life, but Capa is able to calm her down. He regains the ability to see red from this. Color of Night is currently available to watch and stream, download, buy on demand at Amazon Prime, HBO NOW, Amazon, Vudu, Google Play, iTunes, YouTube VOD online.